You don't have to be a roads and highways engineer to figure out why our highways have become sure death traps. They are broken, too narrow, there are no demarcated lanes, no highway patrol to control reckless driving and drivers with fake licenses; there are no speed breakers where they are most needed; there are no dividers; nobody gets punished for a hit and run. All this we ordinary, hapless citizens know, not just because it's plain common sense. It's how things have been ever since we can remember. Governments have come and gone and come again, making lofty promises of how they will improve infrastructure in the process of launching a brand new, shiny Bangladesh. But ultimately it is the same story all over again. Contracts are given to incompetent, corrupt favourites who make sure that the roads are never made or repaired to endure the next rainy season. Potholes are left to become gaping wounds on the already battered roads. Helpers, barely out of their teens and with minimal driving skills are left behind the wheel with the lives of hundreds at their mercy; licenses are issued right, left and centre for unofficial 'tea money'. Add to that occasions of drunken, sleep-deprived driving and the recipe for death is ready and waiting. All this is old, old news. And that's the problem. When you let old problems fester, they grow into impossible monsters that can gobble people alive. What kind of place is this you may demand, at no one in particular, where travelling to the next town amounts to having a death wish? Well, you can scream yourself hoarse when someone you loved or admired and respected, is cruelly taken by a mindless, violent road crash. Nothing will happen because nobody is listening. It makes condolences from premiers ring hollow. Proclamations by ministers that they have already started 'thinking about' four lane highways and issued thousands of authentic licenses sound a little ludicrous. Why, we ask in bewilderment, have they waited so long? Why not at the beginning of their tenure, why not when they first came to power? How many deaths could have been avoided, how much less would have been this burden of grief and loss? There are no acceptable answers; there is only unacceptable stalling, neglect and apathy from the state. The public cannot take it any more. Transport owners have stopped operations in two major highways threatening to immobilise other routes unless the roads are repaired. 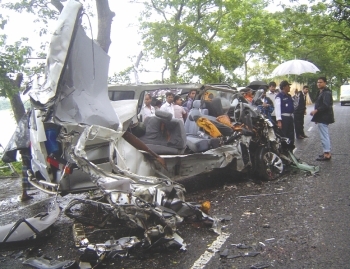 Ordinary citizens are terming road accidents 'murders' because of their frequency and inevitability in the absence of any kind of government effort to make our roads safer. The government can no longer afford to indulge in the culture of indifference practiced by successive ruling parties. We, the public, will no longer accept the fact that a simple thing as going for a picnic or visiting relatives for Eid or watching a game of football outside our village or any other occasion that requires a road trip, has a high probability of ending in tragedy. The ball is, as always, in the government's court.